File photo of the incomplete repair works of SK Asajaya Ulu. 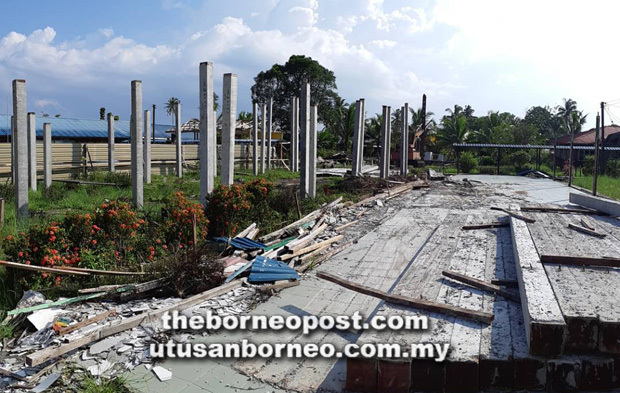 KUCHING: Sarawak Pakatan Harapan (PH) chairman Chong Chieng Jen yesterday urged the government to seriously look into the use of Industrialised Building System (IBS) to repair dilapidated schools mostly in the rural areas. He pointed out that a report that 85 per cent of the projects were behind schedule was a strong indication that such system was unsuitable. According to him, the system is only applicable for a large scale standardised building, and not for upgrading where every school using the system has to be designed. “The project to upgrade dilapidated schools using IBS is hardly 15 per cent in progress and it is a very serious matter, so I call upon the Sarawak government to seriously look into the matter, after all we have our own education minister (Dato Sri Michael Manyin) who has been talking about the system (IBS). “And yet after the award of the projects to the contractors, it seems that they cannot deliver and the system used is not suitable,” Chong told a press conference at the DAP headquarters here. Attending the conference were Bandar Kuching MP Dr Kelvin Yii and Chong’s personal assistant Abdul Aziz Isa. Chong, who is Stampin MP, stressed that not only was the project 85 per cent behind schedule, but the roads leading to the villages were damaged by lorries transporting the IBS materials, and transporting the materials also incurred higher cost. He recalled that he had issued a statement earlier this year to warn the government against using the IBS, but the advice went unheeded by the government. “Not only are the projects behind schedule, but the village roads which were not built to cater for heavy weight are now damaged, so what happened now indicated what I said,” stressed Chong, who is Kota Sentosa assemblyman. Separately, Chong said he had written a letter to Land and Survey Department (LSD) to explain the reason behind the refusal to renew the land lease of a 1.5-acre plot at Lot 176 Gading-Lundu Land District. According to him, the department has refused to renew the land lease for the parcel of land owned by the co-proprietors of the Ocean Beach Resort, which will expire on Dec 31, 2024. He pointed out that the matter came to light when the co-proprietors went to the department early last year for the renewal, but it was refused without any reason. “There is no reason for the government to refuse to renew the land lease and thereby depriving the registered co-proprietors of their property rights over the said land.” Chong pointed out. Chong also pointed out that ‘few individuals’ had approached the land owners last year to buy the parcel of land, but the owners refused to sell.